Dlhá nad Oravou is a village located at the central Orava region, near the Orava Castle, at the district of Dolný Kubín. The village neighbors with other three villages, Sedliacka Dubová, Krivá, and Chlebnice. The northwestern part of the village area is bordered with the hill Ostrý vrch, the northeastern part with the hill Holáň, the eastern area ends with the hill Banský, and the southwestern part with the Žiar Hillfort at the borders with Sedliacka Dubová. The hill fort is known as a prehistoric Hallstatt settlement and visible ruins of St Cosmas and Damian Church and cemetery. The first reference to „villa Dluha Luka“ has been found at the document of Palatine Mikuláš z Góry dated 1420. This document describes the property possession at a period when an owner of the Orava Castle was Stibor of Stiboricz, the Hungarian aristocrat of Polish origin. However, Dlhá nad Oravou has been referred to together with Sedliacka Dubová till the 16th century. The first independent reference to the village dates as late as 1593. The Orava river, that has been a protected area since 1997 for its well-preserved river ecosystems, including lots of species of fauna, flora, and biotopes of many protected, rare and endangered species, flows through the village. Dlžiansky Cickov, the creek starting at Oravská Magura about 995 meters above sea level, flows into the Orava river from the right side. Turín and Chlebnický potok, as the natural streams forming few small waterfalls, flow in the Orava river from the left side. Ráztoky creek running along the borders of the village area joins Chlebnický potok from the right. At the river flat, close to the junction of the Orava river and Chlebnický potok, is the lowest point of the area of Dlhá nad Oravou (525 meters above sea level). At Makovisko - Ivanovo, about 2.5 km to the north from the village, a mineral spring emerges at a fault line, at the junction of lime stones with cherts of the cliff zone and with clay stones of Magura overlying rock. The territory of Dlhá nad Oravou is a part of three mountain units – Oravská Magura (northern part), Oravská vrchovina (central and southern part), and Skorušinské vrchy (southeastern part), all being a part of the Western Carpathians mountain range. Almost the entire territory is hilly. The massif of Oravská Magura has been built mainly with sandstones and clays. Its surface is covered with dense forests with prevailing spruce and beech. 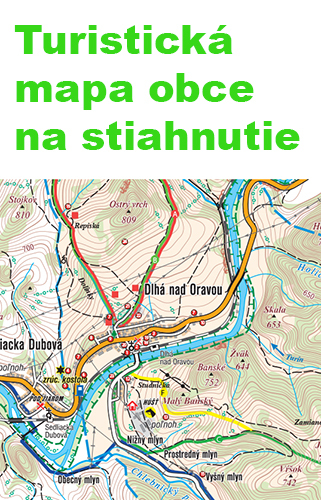 The highest point of the territory of Dlhá nad Oravou is at Prípor (1105,8 meters above sea level), then at Bučina (894 meters above sea level) and Poľana (881,8 meters above sea level). Vysoký Grúň (848,7 meters above sea level), Ostrý Vrch (808,5 meters above sea level), Banský (752 meters above sea level),Osičiny (763,1 meters above sea level), Kálaný (852,7 meters above sea level), and Holáň (794 meters above sea level) are the parts of Oravská vrchovina, while the Cenozoic Turínok (1003,5 meters above sea level) and Lysec (943,6 meters above sea level) are parts of Skorušinské vrchy. To the north of the village can be found an interesting pseudo-karst cave called Kozia diera (Goat’s Hole). According to a local legend, a duck swam from Podbiel territory to Dlhá territory through the cave. Another remarkable thing growing at the center of the village is a silver linden (Thilia platyphyllos), the tree protected by law and interesting from a historical, cultural, scientific, and landscape point of view. The 120 years old tree is 27 meters high and the tree top’s diameter is 18 meters. The Roman Catholic Baroque-Classicistic St. Ladislav’s Church is placed at the center od the village. It was built in 1811 as a chapel, in 1914 extended to the church, and renovated after 1940. On April 23rd, 1963 the church became a national cultural heritage. It is dedicated to Saint Ladislaus I (*June 27, 1040 - † July 29, 1095), who was the Prince of Nitra principality from 1063 thru 1077 and the King of Hungary from 1077 thru 1095. The painting of St. Ladislav by the spring dominates at the main altar of the church. Above it is a painting of St. Family and the statues of St. Peter and St. Paul are placed on the sides. The side altar of Rosary Santa Maria illustrates Santa Maria sitting on the throne holding little Jesus. St. Dominic de Guzman, the founder of the order, and St. Catherine of Siena are kneeling at her feet. The Rosary Santa Maria altar gives evidence that the village ancestors had established a Rosemary fellowship in the past. The wooden reliefs at the bottom part of the altars depict two dying people, who differently experience their last minutes of the life. The other persons of the reliefs sufficiently show their feelings, which provides an opportunity for each person to make the right choice in their lives. The statues of St. John of Nepomuk and Sacred Heart of Jesus are placed at both sides of the altar. The other side altar depicts the Sorrowful Holy Virgin holding Christ’s corpse and the statues of St. John and St. Maria Magdalena placed at both sides of the altar. St John represents a modest submission, devotion and quiet proximity to the person of Jesus Christ. He remained till the end below the cross at Golgotha. Later, after the resurrection, he followed his teacher as a loyal student. The statue of Maria Magdalena represents the penitence and at the same time leaves the message: It is never too late for a change in our life. This statue holds a container with an aromatic oil, because after Jesus died, she went to spread the oil on his corpse. However, how surprised she was, when instead of a dead Jesus she met the Resurrected Lord as the first. Three painted scenes, from about 1921, can be found on the vault of the church. The eastern vault by the triumphal arch shows the scene of the Last Judgment after the second coming of Christ. The Last Judgment scene is composed of several parts. The central figure is Jesus Christ, the Judge, with apostles, saints, and angels on both sides. Santa Maria is kneeling at Christ’s right side and speaks for those, who are to be judged. Above Christ the Judge is a group of angels playing trumpets to wake up the dead. Vertically below Christ is Archangel Michael weighing souls. At the bottom part of the scene the dead are emerging from the ground being at various stages of transformation in the sense of Ezekiel’s vision of a plain full of dried human bones covered with muscles and revived, which had been considered a prototype of general concept of resurrection of the dead. The figures of angels are on both sides of Christ. The angel on Christ’s right is giving the key of heaven paradise to a group of male and female figures and the other angel carries one of the figures up to heaven. The angel on Christ’s left holding a flaming sward drives the damned to hell with monsters and winged daemons (Mt 25,31-46). At the western part of the aisle a scene of the Mission of Ss. Cyril and Methodius is painted. The two saints are accompanied with a group of people standing against them listening their speech. The hierolatry of these saints has deep roots in Dlhá nad Oravou, which also proves a stone sculpture of Calvary and the statues of Ss. Cyril and Methodius at the entrance gate to the church, as well as the two of six bells placed at the church tower were named after these saints. The other four bells are named after St. Peter, St. Paul, St. Joseph, and St. George. The third painting placed at the western part of the aisle shows a scene of execution of an early Christian martyr at the time of Diocletian, the Roman emperor (284 – 305). His reign is also noted for the last great persecution of the Christians, when the emperor issued four decrees depriving Christians their personal liberty. Roman soldier Alexander, the commander of a century of the Theban Legion, succeeded to escape before the massacre of the soldiers of this legion, who refused to martyr local Christians. Roman soldiers finally captured Alexander and brought him in vinculis to Bergamo in Italy. Alexander could choose between veneration of pagan idols or decapitation. He washed his hands with water, started to pray to God and put his neck forth to executor, who decapitated him on August 26, 303. This martyrdom of St. Alexander is the theme of the scene of the church. In the first half of the last century, an unknown author of the painting in Dlhá’s church was probably inspired by the picture “The Martyrdom of St. Alexander” placed at Art Gallery of Vatican Museum. On July 24, 2011, mons. František Tondra, Spiš bishop, consecrated the restored St. Ladislav’s Church and new altar. The altar shows a symbol of Abraham’s Faith and the relics of four saints, St. Francis de Sales, St. Victor, St. Gaudentius, and St. Gemma are placed at the front of the altar, at the cross shaped reliquary. In 1914 thru 1916 an organ made by Otto Rieger company from Budapest under opus No 2004 was built in the church. The organ was rebuilt in today’s look in 1960 and its general repair was completed in 2010. Three crosses placed on the tower and the roof of the church aesthetically and artistically complete a proportionally well balanced silhouette of the church. A large Cyril and Methodius double cross placed on the tower of the church was made in 1863, the year of the thousandth anniversary of the Coming of the Missionaries. It is a product of a local blacksmith and his assistant, and it is very probable, that the cross contains also an iron from forest, agricultural, and household tools being used by the hands of many local people. A copper dome under the cross is another masterpiece of the Slovak coppersmiths. At the restoration in 2012, a valued letter left by the ancestors on June 2, 1863, was found at the dome. A small double cross placed on the roof of the church, made by the local blacksmith Andráš Kaučarik in 1874, is another masterpiece. The cross has been made by scappling and shaping of an iron profile, while the joints have been riveted and sleeved. The third cross comes most probably from the period of the extension and is placed on the roof of the church. St. Ladislav’s Church has been a significant part of the cultural and spiritual heritage of our village, serving daily to the believers as a parish church for almost 100 years. It happened during the period of his reign, that the Russians invaded Hungary, ravaged several villages and towns, and returned home with a rich booty. The king declared war to the Russians and marched to the battle with a big army. One of the legends says, that when marching by Jasov, the soldiers were so terribly thirsty, that they began to cry in their suffering. Their cry was heard by a Tartar commander who teased the king Ladislav asking: ”Hey, king, why are your soldiers crying?” Because they cannot wait to meet you in a battle”, answered the king. However, before beginning fighting, the king turned to God praying for some refreshment for the weakened soldiers. God heard his pray and a fountain of water sprang out of a stone, which calmed soldiers’ thirst and so they saved their lives. From among the phenomena of a traditional folk culture, folk traditions, customs, and ceremonies have a special status, including also folk art, such as singing, dancing, music, theatre, folk costumes, and works of art and craft. They all are an essential part of human life. The clothes have a special place and attract both, laic observers and professional and artistic specialists. The clothes of Orava people were very lively and the folk costume of Dlhá’s people shows an aesthetic feeling of people, being reflected in rich ornaments. Although nowadays only few older women wear the costume every day, it has also been presented by the local folk group, that shows a beauty of the traditions and customs of Dlhá nad Oravou at their performances. Dlhá nad Oravou is also proud of its original architecture that survived a big fire in August 1962, especially grain cribs – the little log houses called "sypárne", that had been used for the storing of the agricultural products. Clusters of the grain cribs were built at the end of the village and along a creek. The grain cribs built at the peripheral parts of the village, that have not been damaged by the fire, survived as the silent witnesses of the past architecture of Dlhá nad Oravou. Some of the grain cribs were declared as the national cultural heritage in 1963. Several exceptional monuments, connecting the present with the past, can be found in the village. The oldest sacred monument is a baroque stone column with a statue of St. John of Nepomuk. The figure is shown frontally with a slightly leaning head, holding a corpse of Christ on his both arms. Until recently, the column had been dipped in the ground to a third of the height and its frontal side bears a writing dating 1781, that was sixty years after the beatification of St. John of Nepomuk by the pope Innocent XIII. St. John of Nepomuk was in his life a defender of the church against the Czech king Wenceslas IV, for what he had been tortured and thrown into Vltava river from the Charles’ Bridge in Prague, sewn in a bag. This way of his martyrdom is reflected at the places chosen for the posting of his statues and chapels– by rivers, creeks, bridges, and fords. In Dlhá nad Oravou, his statue is placed by the village creek , near the Church of St. Ladislav. The most destructive flood in Dlhá was at the beginning of the 19th century, totally destroying the river bank. The burying of the third of the colomn most probably happened during this flood. By its primary coloring, the column represents a considerable relic value that has not been preserved at many similar sculptures. Near the statue of St. John of Nepomuk another relic can be found – a stone column showing the Coronation of Virgin Maria. Embossed into this column is again St. John of Nepomuk. This pillar is newer, from the year 1894, and represents a notable sculpture workshop of Belopotocký from Oravský Biely Potok. The Orava stone sculpture, especially the statues placed on pillars, made in the 18th and 19th centuries, bear some baroque, classicist, and rustic features that prove devotional respect of the people who had them built. The rustic character of the presentation underlines a sincere intention of the sponsors and authors. The Another artistic value is at the gravestones that had been made at the workshops of the Orava stonecutters in the 19th and 20th centuries, and that still can be found at Dlhá’s cemetery. On the hill above the village, the Fatima Chapel was built in 1946 to thank for the protection of the village during the liberating battles of the WWII. On the day of the Immaculate Heart of Mary, a mass is celebrated at the chapel every year. Among the other sacred monuments are the Chapel of the Rosary Virgin Mary, the Chapel of Jesus Tortured to Death, St. Anna Chapel, and the Crucifix placed beyond Skalica, originally made of sandstone in 1858, raised in the middle of the countryside, by the road to Magura. Sports association named TJ Sokol (Falcon) was established in 1959 and friendly football matches with the teams from the nearby villages could be played on a playground built by the volunteers. Because Dlhá’s team was quite successful and the football attracted many fans, they decided to register at a competition in 1960. As early as at the first year they proved that the success achieved at the friendly matches was not accidental, when they advanced to the higher level of the competition, at which they had not been shy, because they ended as high as at the fifth position. Close before the beginning of a new football year in August 1962, the big fire had swept the village, when 83 wooden houses burnt out. Football costumes kept at the players’ houses were also destroyed by the fire. Who helped them in that hard time was TJ Slovan Bratislava, the most popular and the most successful Slovak football team. Their aid had been deeply appreciated by TJ Sokol Dlhá, because thanks to it they could stay at the competition. In honor of this act, they renamed their sports association to TJ Slovan Dlhá nad Oravou. Organized skiing began to write its history in 1970s, when the first skiing lift 260m long was installed at the slope Nad studničkou. This provided new opportunities for young skiers to represent their village at skiing races all over the district, as well as to ski for pleasure. Later, when the sports association was renamed again to Sports Association (TJ) Družstevník, and its activities expanded, hiking tours became very popular. The local hiking club organized tours to the surrounding mountains, such as Roháče, Choč, Kubínska hoľa, Oravská Magura, Babia hora, and others. In 2005, a table tennis club was established, providing opportunities to represent the village at local races till the year 2008, when an independent Sports Club, roofing also the table tennis, was established. This was the end of a short, but nice period of the table tennis club of the Sports Association (TJ) Družstevník Dlhá nad Oravou. Soon after the establishment of the new Sports Club, its table tennis players became very engaged at the Orava region table tennis competition, the performances of which have been increasing from year to year. Two teams of Dlhá nad Oravou represent the village very well. Inhabitants of Dlhá, who like hiking, have been active at the hiking club, that organizes tours to more or less distant valleys and mountains. They have been hiking at Kvačianska valley, Prosiecka valley, Dierová, the mountains of Babia hora, Kriváň, Sivý vrch, Choč, Rozsutec, and others. Table tennis and football clubs have their representation at children, junior, and senior levels. Besides their activities at the competitions, both clubs are also active at organizing local traditional sports events. Last Saturday in January belongs to a winter hike around Dlhá landscape, while summer hike takes place at the beginning of July. Both, Mayor’s Cup international table tennis tournament and Mayor’s Cup traditional football tournament take place in summer, while end of year belongs to Mayor’s Cup village table tennis tournament. A base of an active social life of the village are its inhabitants, who help to a broad development of their municipality either individually or as members of associations, clubs, and other social institutions. Besides the sports organizations, a voluntary fire brigade established in 1928 is active in the village. Its members fulfill their responsible roles not only at disasters, but also at various social and family events. All categories of Dlhá’s firemen actively participate at all available performance-based competitions, where they fairly represent their village. In 2003, a core organization of the Slovak Union of Seniors was established in Dlhá, uniting Dlhá’s seniors, who can actively participate at the social life of the village. Besides organizing of trips to various places of Slovakia and other countries, the seniors are co-organizers of the most of the village events. “To give beauty and joy to people” – has been a goal of a revived folk art group in 2007. At its performances, the folk art group named „Pod Ostrým vrchom“ shows its public traditional “jewels” in the form of songs, dances, and traditions. This precious heritage, left by the ancestors, has been so preserved as a message for future generations. Orava region is beautiful all year round, in all seasons, and when you are lucky to observe the countryside from a carriage pulled by such noble animals as horses are, it looks even better. The horse riding center Húšť offers this unique experience to all its visitors. Primary School (grades 0-9) and Daycare is another institution, that fulfills its important role in education and other areas of life. The school work and cooperation with other village institutions are essential for cultural, spiritual, and social development of the village. Cross-border partnership is a bilaterally favorable phenomenon of activating and inspiring municipalities, state, municipal, and non-profit organizations of the village. Nowadays, Dlhá nad Oravou has been delighted with a well developed cooperation with Polish Gmina Dobra and Czech Velká Polom.